Roxie was raised in Colorado and graduated from Douglas County High School. After graduation, she received her certificate in expanded duties dental assisting and went on to receive her degree in dental hygiene from Colorado Northwestern Community College. She strives to educate her patients as if they were her own family members giving them information they need to care for their mouth between dental cleanings. The most rewarding part of her job is seeing improved oral health in patients. By attending regular continuing education courses, she stays current on the latest in dental care and technologies. Roxie is married to Mike and they have two children whom they home educated through out their school years. They enjoy volunteering, being active in their church, playing in the mountains, fishing, and spending time with friends and family. In Roxie’s spare time she enjoys gardening and making and selling homemade goat milk soap at a shop in Elizabeth. At Premier Dental Health at Eagle Bend, we believe healthy smiles are built by practicing core values such as quality, integrity, and compassion. 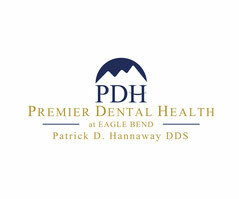 Your dental experience is important to us Dr. Hannaway and the PDH Dental Team strives to provide patients with timely, friendly, and knowledgeable customer service. During your visit, notice our clean medical environment. Our investment in new dental technology translates into accurate and efficient appointments.